Published March 5, 2015 By Anna T. This post may contain affiliate links. Regardless, I only recommend sites I've researched and/or used and trust. While it's true that a simple Google search will help you find plenty of work from home information on websites and blogs like this one, there is still something about actually sitting down and reading a book on a subject that's a bit more satisfying and allows your brain to process the information in the proper way. So with that in mind, this post is a list of e-books in the work from home niche that are really good and will help you if a “guidebook” is what you need for a specific topic. These are not all general work from home. Some are more niche specific. But, they are all books that I've either read, are extremely highly-rated, or I've seen them recommended multiple times. I just read this one the other day, it's written by Adeline Ganley of the Frugal Fanatic blog. Each chapter focuses on a different work at home industry, and one thing I really like about it is that it does more than just tell you WHAT you can do from home. It also tells you HOW you can do it. Lots of general work at home info, presented in an easy-to-understand way by Connie Brentford. Links to specific companies are included along with a little information on how each company works and what you can expect. Has over 100 4 & 5 star reviews on Amazon. 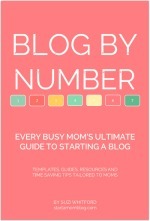 This eBook was written by Suzi Whitford of Start a Mom Blog and explains in detail how to set up your blog up, monetize it, market it, and get traffic. I was very impressed with it and it has become one of my go-to blogging e-books to recommend to beginners. The book alone is $17.99 (and well worth that price), but she has some good e-courses you can take. This book (and also Ruth's course that I took) was a game-changer for me. Ruth Soukup talks about everything from what ad networks to use to how to effectively market your blog on Pinterest. She provides you with an actionable, realistic plan to turn your blog into a profitable business. This is another that I got a lot out of. Bob Lotich writes in a very easy-to-understand way and really breaks everything down for you, sharing a lot of his own strategies that he uses on his popular personal finance blog, ChristianPF.com. He also wrote ProBlogging Secrets for more advanced bloggers. This book by Lisa Mills answers ALL your transcription questions. Lisa even gets very specific about how much you can expect to earn as a work at home general transcriber and what rates are and are not considered fair. There is also information on companies that hire general transcribers on a regular basis. This one is written by our very own Leisa Good, an extremely experienced virtual assistant. The book has just been updated for 2015. It covers everything from getting various certifications to finding clients — all in a concrete, 21 day plan that will show you how to get your VA business up and running in 21 days. This book, written by Lisa Morosky and recently updated for 2015, gets recommended everywhere for aspiring virtual assistants. As of the date of this blog post, it's been reviewed 70 times on Amazon, and 66 5-star reviews on Amazon.com. Very impressive! If you are looking for actionable information on starting your own craft business, this is a highly recommended book. It was written by the founders of a successful company, Liberty Jane Clothing, and it outline a 15-day plan for getting your own business of the ground. It has over 80 5-star reviews. If you don't necessarily want to start your own craft business and are instead looking for online platforms you can use to get your crafts sold to others, this is a book I have read and would suggest. It lists some places you've likely heard of (Etsy, etc. ), and some you probably haven't. This is one of the first in an extensive series of books about selling on eBay written by Ann Eckhart, and it covers buying items at thrift stores and garage sales and then re-selling them at a profit on eBay. Ann has been doing this for more than ten years and she knows the tricks of the trade. The book is very highly rated on Amazon. Amazon.com is another site where you can certainly make a lot of money selling just about anything. Stacey McCafferty appears to be one of the best go-to resources for this. She currently has at least three highly-rated books in her Amazon Mom series that overall get great reviews, the first of which is linked above. 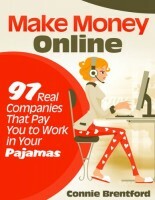 If you need to earn some money pretty quickly and you can write well, this book will help you. Connie Brentford has written quite a few work from home related e-books, and this is another of her most highly-rated ones. The book contains a list of companies/blogs that are (as of 2014/2015) hiring writers and paying $50+/post. If you want to get your freelance writing career off the ground and land lots of high-paying clients, this book may help. It promises to give you tips and strategies for negotiating for more money and better terms without risking your freelance writing career. I hope this list helps! None of these books are very expensive, and they all contain lots of helpful, quality information that will get you thinking. 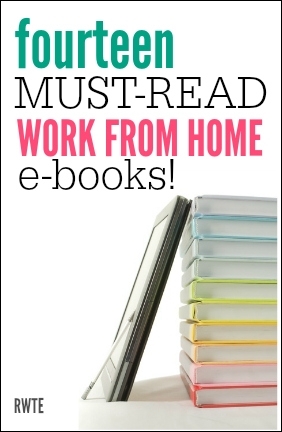 If you want even more book recommendations, check out my work from home e-book library here. Unlike this post, that list doesn't have little descriptions beside each listing, but there are way more books listed. I took care to only list things that I've either read and enjoyed or that are overall very highly-rated. @Anna T. – Thank you so much for the recommendation and great compliment! I really appreciate it! @Lisa – Good to see you! @Deborah – Thanks! There really is a lot of information available. I have read several myself. This was a really good article. I have read some of these book. There is some I haven’t but will look into now. With many of these books there is a lot of information to learn from. Thanks for the recommendation, Anna! 🙂 I really appreciate it!